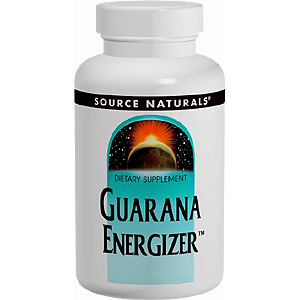 Guarana, a natural herb imported from Brazil, has been used for centuries by indigenous people of the Amazon as an energizer. 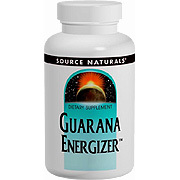 Source Naturals offers you a 900 mg standardized extract of guarana seed. Each tablet contains approximately 200 mg of naturally occurring caffeine, which is one to two times the amount in one cup of coffee. 1 tablet as desired. If stomach upset occurs, take with food. For adult use only. Each tablet contains approximately 200 mg of naturally occurring caffeine, which is one to two times the amount in one cup of coffee. Caffeine may cause nervousness, irritability, sleeplessness or rapid heart-beat. If you are pregnant, breastfeeding, or have fibrocystic breast disease, consult your health care professional before using this product. Supplement Facts Serving Size: 1 tablet Amount %DV Guarana Seed Standardized Extract 900 mg Other Ingredients: microcrystalline cellulose, dibasic calcium phosphate, modified cellulose gum and colloidal silicon dioxide. Guarana Energizer - 60 tabs is shipped in a discrete, unmarked package. Orders are processed immediately and usually take about 3 to 5 working days to be received. We do ask that you try it for 2 to 3 weeks to feel the full effects. Any information received is used only for order processing and shipping purposes. Your information, such as e-mail address, will never be disclosed to a third party.